Thursday brings us to the letter C.
C is for Captain America! I've always had a soft spot for Cap. It started way back in middle school, when the videogame "Captain America and the Avengers" came out. At the time, I had a paper route and saved my money so I could get the game for the Sega Genesis. I played through "Captain America and the Avengers" a lot. Actually, my brother and I were awesome at that game, with my brother as Iron Man and me as Captain America. I think we could beat that game without losing a single life. So, I've always liked Captain America, a character who represents a favorite theme of science fiction: the man out of time. In the comics (and the movie adaptation previews this for the upcoming Avengers movie), Cap saves the world, falls from the sky, and gets frozen in ice. He's awakened decades later to find the world has changed more than he ever imagined. Most of his friends are gone; the ones who are still alive are advanced in age, and Cap has a sense of loneliness few can empathize with. Before he was Captain America, he was simply Steve Rogers, a sickly kid who couldn't fight for his country even though he wanted to. He volunteers for an experiment, and with the power of the Super-Soldier Serum, scrawny Steve transforms into a perfectly-toned superhuman with enhanced strength and speed. He helps the Allies win World War II before stopping a doomsday plot and presumably dying. Steve Rogers isn't the type to give up so easily, and he remains in suspended animation until the day someone comes to find him. 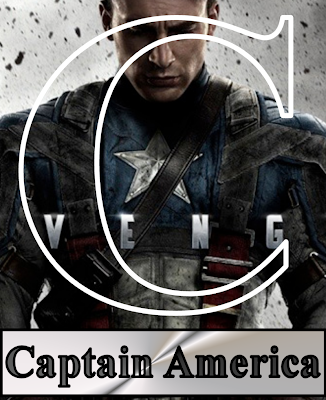 A born leader, Captain America holds true to traditional American values and is the natural choice to serve as the eventual leader of the Avengers. Of course, he has to contend with other heroes who think they know a lot more and grapple with his own self doubts as a man out of time. Oh, and the shield? AWESOME. Tomorrow: Are you worthy of the Helm of Nabu?